Their matches looked like men against boys at times during Euro 2012, so the post-match scenes that greeted Spain's victory last night seemed entirely appropriate. Having made light work of Italy in last night's final, Spain's all-conquering players were quick to celebrate on the pitch as they paraded the trophy in front of thousands of jubilant fans. The on-pitch celebrations were led by adorable two-year-old Nora Torres, the daughter of striker Fernando Torres, 28, who scored Spain's third goal in Kiev as the world champions cruised to an historic 4-0 victory. Several first team players, including goalscorer Torres, midfielder Xabi Alonso and goalkeeper Jose Reina let their young families join in the pitch celebrations, with the children appearing to enjoy the spectacle even more than their footballing fathers. 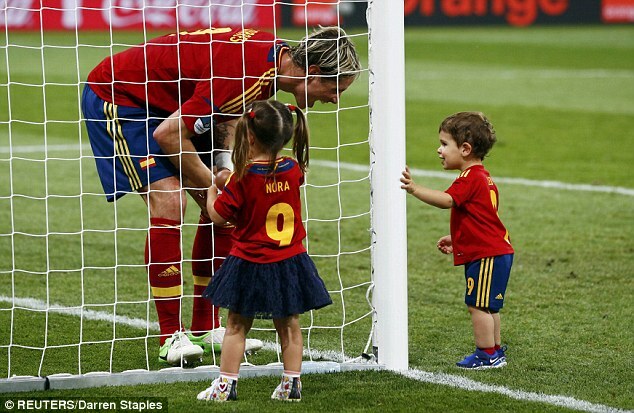 Torres's young son Leo and daughter Nora were among several kitted out in their miniature Spain replica shirts, toddling joyfully around the pitch and playing with glitter used during the trophy ceremony. Likewise Spanish goalkeeper Jose Reina, although not used in the tournament, was another who took the chance to take in the winning moment with his family. The Liverpool keeper was pictured soaking up the post-match atmosphere in Kiev with his two adorable daughters Grecia, five, Alma, three, and son Luca, one. All the children invited on to the pitch did not appear overawed by the huge football stadium and crowd, and appeared happy just to play in the goalmouth and wander around enjoying the moment. Real Madrid midfielder Xabi Alonso, who was instrumental in Spain's historic tournament triumph, was another who revelled in victory in the company of his wife and children. 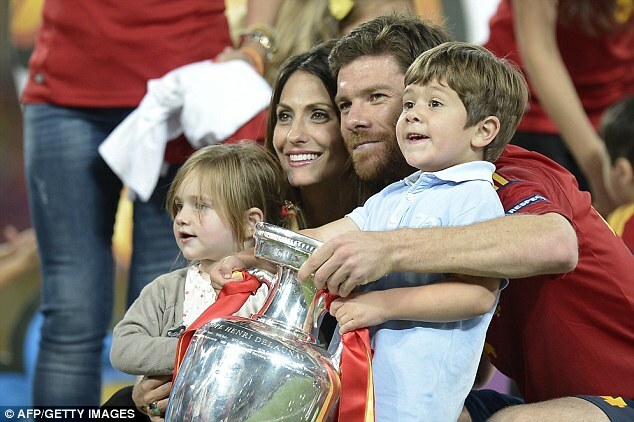 The thirty year old midfielder posed for pictures with the trophy alongside wife Nagore Aramburu, son Jontxu and two-year-old daughter Ane.